Solar cover users: Do you have a reel? Do you use a solar cover reel? Just interested in how many solar cover users use a reel. Why or why not? Which one do you have? Like it? Hate it? Comments welcome (pictures, too!). I have a cover but no reel. It takes me about 10 minutes to get the cover off when I use it because it usually has pine needles on it, which I have to collect as I fold it up. While I am in the pool, I fold it into a big square and flip it onto the deck. If it's been windy or rainy, it can be a real pain. I have not used my cover this summer. I had it replaced under warranty at the beginning of the season and haven't opened the new one yet. It is so much nicer to just be able to get right in and not deal with the cover. I am thinking of getting a reel next year. I don't have a reel YET but I plan to get one. I am not using the cover at this time. I will start using it when the weather gets cooler (maybe October?) to keep the water from losing too much heat at night. Sometime before that I will buy or make a reel. The cover is a real pain to deal with otherwise. I'm confused about how reels work, particularly for a round pool where the deck does not extend the full width of the pool (like mine). I can't envision how they can work without dropping all the crud from the top of the cover back into the pool. We cut our solar cover into five sections. Here are some photos and a description of the process. I know it sounds weird but it works well for us. We roll ours up on the freestanding reel at the end. If there is debris sitting on it, I flip/fold the far end with the rope attached over on top of itself, then start reeling up. When it gets to the end with the reel, I hook the rope with the end of the skimmer net pole and that little end with the junk lifts right out. Its not heavy, not difficult and I can do it all one handed, reeling up and all. Ours is a large oval and we have no problems with on or off. That is a neat solution, Anna. I just don't know if it would work on a round pool where the cover tends to spin with the current. I wouldn't want to cut my cover and then find out it's no good. NWMNMom: What do you mean by "freestanding" reel? Sorry, for the basic questions, but I have never seen these in action. I feel like I need a step-by-step in pictures! Funny solar cover story... One day last year I went to get in the pool and noticed a baseball sized hole (like a flap) in the solar cover. I got in and started folding up the cover and there, floating in the pool, is a baseball! We don't have close neighbors, or a nearby baseball field, but we do have a 6-foot privacy fence, so it seemed very odd! My husband still swears there is NO WAY the baseball could have made the hole in the cover. I don't see how it could have happened any other way. Not-so-funny solar cover story... Several years ago, our solar cover saved our dog's life. Our deck is elevated with a gate on the stairs, but we didn't know (until this happened) that our little dog could sneak around the gate from the top step. My hubby just happened to be working on the pump for our well that day and since the water was turned off, he went out to the pool to get a bucket of water to rinse something off. Much to his surprise, there was our little dog Lucy, sopping wet, looking exhausted, sitting there on top of the solar cover. You could see scratch marks along the edge of the vinyl liner where she struggled to get out... I guess eventually she managed to get herself up onto the cover and rest. Poor thing, but when she was on the trail of a raccoon, nothing would stop her. We now have an additional barrier next to the gate to our deck. Thanks, Matt! With a rig like that, I guess you'd crank it clockwise and then any debris would probably just fall off the back, huh? My thought is to do something like that and maybe have the poles come up higher in order to also support a solar panel, but that might be too ugly. That's pretty much how it works - it's easy to work, the pool is 30 feet in diameter, takes me one minute to remove and roll up nice and flat, which entails a couple of side to side trips to stretch it onto the roller flattened. To unroll, it's best to just grab it from inside the pool and walk backwards towards the stairs - even my 8 yr old son can do it with some effort. My solar panels are on the ground on the far end that you can't see (just past the filter) , surrounded with edging and gravel like the rest of the pool, it's the south side and the slope is about 5-10 degrees. As for the reel/no-reel question, I have always had a cover for my pools (past & present) but only recently got my first reel. BOY have I been missing out. It was always a pain to take on and off and took up too much room. Now you just crank and swim. I wont even NOT have a reel again. What about mold/mildew? Could issues develop if a cover is rolled up and left rolled up for a week? away for a couple days. This may not be the right post, as I don't have a solar cover, but I am just curious how big (diameter) the cover is rolled onto a reel? I have limited deck space on the end of my 16x32' IG pool where I would want to locate a reel. 18 inches at most (18x36' pool). We move out reel off to the side of the yard against the fence. No reel yet, but it's in the budget for next season. I didn't think a standard roller would work well for a free form pool so I went with this roller. It is a bit quirky but does the job. I have a freeform 14x32 and I fold the sides in and then from one of the ends I roll it up by continually folding it every two feet or so. Takes me avg 3 minutes to take off and 2 1/2 min to put on. I then just fold it in half (2x5) and place in a shaded area. 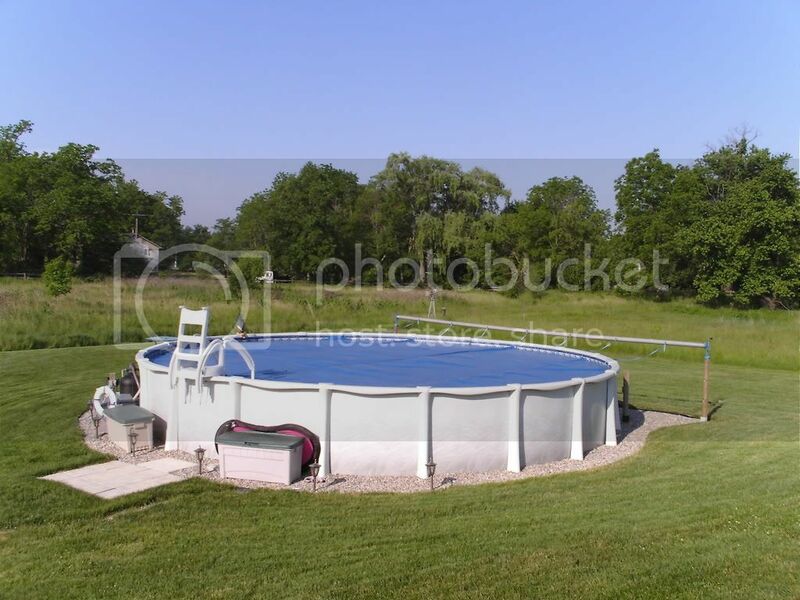 We've got a 24' Round pool. We cut the cover into 2 semi-circular halfs & roll each one up when we want to remove them...then lift out of the pool and put on the stone patio. Takes about 5 minutes total. When we want them back on, we lift each roll into the pool...unroll one and get it positioned on the far side of the pool (from inside the pool) , then life the other unroll it enough to figure out it's proper orientation...then finish unrolling it from inside the pool. One usually needs then, to navigate through the cut seam...usually at neck-level, giving the ghoulish appearance of one's head floating across the surface of the cover. Putting it back on takes about 10 minutes. We tried "The Solar Pill" earlier in the season but weren't impressed by it's performance. Hubby says I've used up my allotment of projects for this year, but he is willing to build me a reel for next season after hunting season closes. So I will have to continue to fold my cover for the remainder of this season. I found an old solar blanket we still had rolled up and stored, and I decided to experiment on the old one by cutting it up. I cut it into 3 6-foot wide sections (right along the factory seams) for my 18' round pool, and that seemed like it would work really well without a reel. Unfortuntely, that old blanket is so dirty I can't bring myself to use it and I don't want to cut the new one if I am getting a reel next spring.